MyFitnessPal is a free calorie counter and fitness tracker app, ranking number one on the App Store’s free chart in the Health & Fitness category, and in the overall top 100. 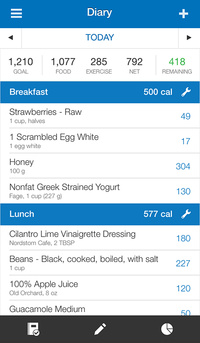 The app is a product of MyFitnessPal.com and is also available on Android. While the absence of a price tag is definitely a plus, what sets this app apart from others is its easy to use interface and handy features, such as optional alarms to remind you to log food and exercise, and an ability to connect with other calorie counting friends for motivation and encouragement. 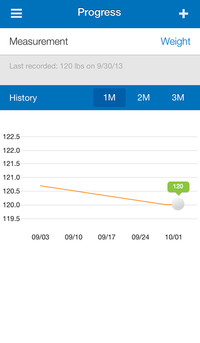 Keeping a food and exercise diary can be time-consuming and isn’t always practical, however, with the ability to do so on your phone, and with numerous shortcuts provided on the MyFitnessPal App, it can be less of a burden. To add food or exercise, you can either search for it in the app’s database (which boasts a total of over 3 million foods) or simply scan the barcode on food packaging. MyFitnessPal saves your recent and favourite foods and exercise to make logging quicker with each use. As well as seeing the amount of calories you have consumed and/or burned, the app creates nutrition graphs based on the percentage of fats, carbohydrates and proteins you have consumed. 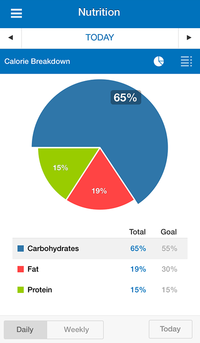 These visualisation of data provides an easy to understand breakdown of your diet. Progress charts are another helpful visualisation and tool to motivate. 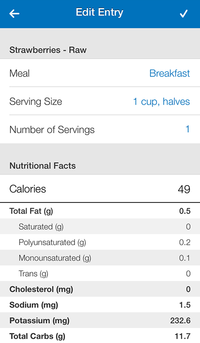 MyFitnessPal is an easy to use, convenient and helpful app. With a $0 price tag, all you have to lose is the kilos!